Prawns are one of my favourite ingredients. I call for them to be cooked in the oven here, but they are also awesome barbecued – the charring adds complexity of taste. Salmon or ocean trout are great substitutes in this recipe; they cook nicely in your oven or, again, on the barbecue. 1. Combine sea salt, vegetable oil, red miso, honey, mirin, ginger and garlic in a large bowl, and whisk well until smooth. Add the prawns, mix well and leave to marinate for 1 hour. 2. Preheat oven to 220C. Place the prawns in one layer on a wire rack set over a foil-lined baking tray. Bake for 8 minutes: the prawns should be just cooked. 3. For the slaw dressing, combine white miso and lemon juice in a bowl and whisk well until smooth. Add castor sugar and whisk well to combine. Whisk in yoghurt, olive oil and sea salt flakes, taste and adjust seasoning if required, then set aside. 4. Place cabbage, carrot and spring onion in a large bowl and mix with your hands to combine. Add dressing and mix well. 5. 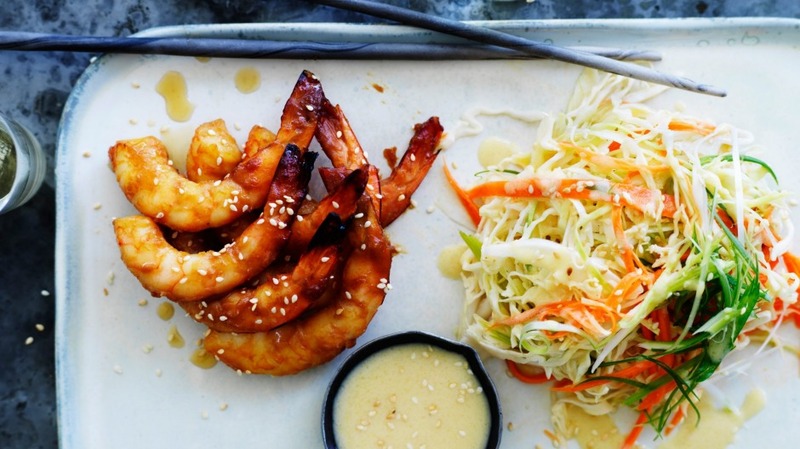 Arrange 4 prawns on each plate, add a pile of slaw to the side, and sprinkle with toasted sesame seeds. Add a wedge of lemon and serve.